Last Sunday the weather was glorious so i decided to take myself off for a walk in the nearby village of Pirbright. I had found details of the walk on a website somewhere and had long wanted to try it out. I parked up by the beautiful village green and set off towards the parish church. I love churchyards as any readers of my Blog would probably have gathered! I love the history and stories associated with the headstones. Pirbright churchyard did not disappoint. There, in the shade o f some trees was a large and magnificent headstone belonging to none other than Henry Morton Stanley. Who? you may ask. was born John Rowlands on 28 January 1841 in Denbigh, Wales. His parents were not married, and he was brought up in a workhouse. In 1859, he left for New Orleans. There he was befriended by a merchant, Henry Stanley, whose name he took. Stanley went on to serve on both sides in the American Civil War and then worked as a sailor and journalist. In 1867 Stanley became special correspondent for the New York Herald. Two years later he was commissioned by the paper to go to Africa and search for Scottish missionary and explorer David Livingstone, of whom little had been heard since 1866 when he had set off to search for the source of the Nile. Stanley reached Zanzibar in January 1871 and proceeded to Lake Tanganyika, Livingstone's last known location. There in November 1871 he found the sick explorer, greeting him with the famous words 'Dr Livingstone, I presume?' Stanley's reports on his expedition made him a household name. When Livingstone died in 1873, Stanley resolved to continue his exploration of the region, funded by the Herald and a British newspaper. He explored vast areas of central Africa, and travelled down the length of the Lualaba and Congo Rivers, reaching the Atlantic in August 1877, after an epic journey.Failing to gain British support for his plans to develop the Congo region, Stanley found more success with King Leopold II of Belgium, who was eager to tap Africa's wealth. In 1879, with Leopold's support, Stanley returned to Africa where he worked to open the lower Congo to commerce by the construction of roads. Competition with French interests in the region helped bring about the Berlin Conference (1884-5) in which European powers sorted out their competing colonial claims in Africa. Stanley's efforts paved the way for the creation of the Congo Free State, privately owned by Leopold.In 1890, now back in Europe, Stanley married and then began a worldwide lecture tour. He became MP for Lambeth in south London, serving from 1895 to 1900. He was knighted in 1899. 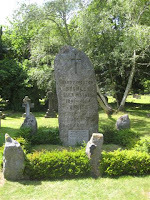 He died in London on 10 May 1904 and was buried here in the churchyard at Pirbright where he had his home. 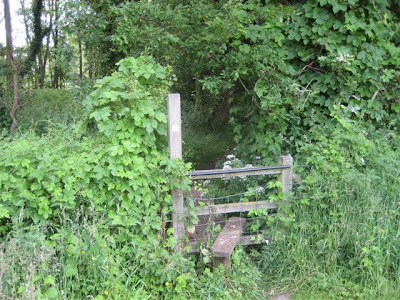 I carried on with my walk following the signpost for public footpaths, clambering over wooden stiles and through kissing gates, going over fallow fields, over farm land, paddocks and into dark woods. A really varied landscape over only a few miles. 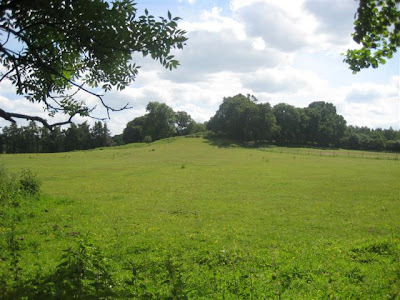 A small hillock on the edge of a meadow. One of the many stiles. This one leading into dense woodland. 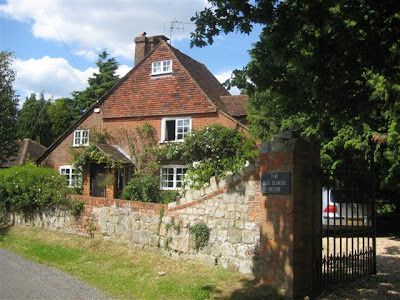 One of the many beautiful houses encounted during my walk. Nearing the end of my walk i passed over Pirbright Common and found myself walking along a narrow track past some old nurseries. I turned a corner and had the fright of my life. 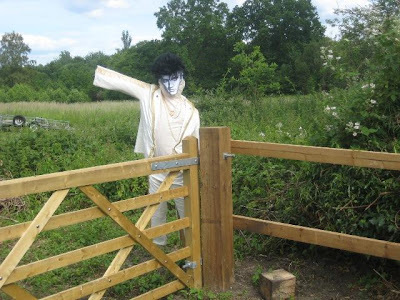 There leaning against a wooden gate was a very realistic looking scarecrow dressed up as Elvis Presley. I don't know if it scared the birds, but it sure scared the hell out of me! Elvis is alive and well and living in Surrey.